A roofing system is composed of a deck, ridge vent, flashing, vent pipes, soffit, fascia, and gutters. When any of these components fails, your home can be exposed to elements that can damage its internal structure. Worse, other components may also start failing. A thorough inspection of your roof by professional roofing contractors in Michigan should be done every three to five years. This ensures that your home remains protected from different weather conditions annually. During inspection, roofing experts will assess for damage. Depending on the severity of the damage found, your system might need either repair or replacement. Factors like age, weather conditions, installation, materials, and maintenance affect the performance of your roof. Repairs are done for minor issues to avoid further damage. This is also the more practical solution if majority of your roof is still in good shape. For instance, when only a section of your shingle roofing system requires fixing, you can ask roofing companies in Michigan for shingles that are in the same shade as your existing roofing. A few torn shingles are also easier to replace than removing the system entirely. If you’ve had your roof for over 20 years, you should consider a complete roof replacement. An old roof will not be able to provide your home with full protection. Further, it may fail in short time because it is more prone to the elements, which may affect other parts of your home. 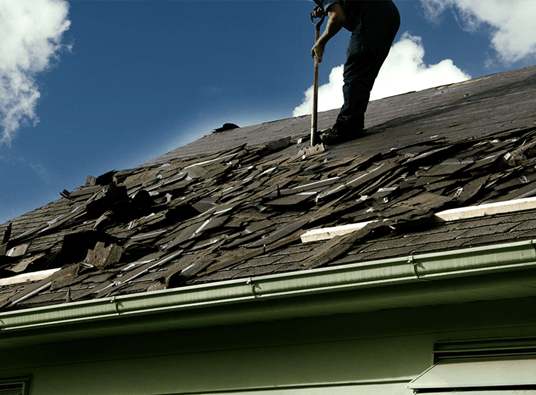 Knowing what signs call for roof repair or replacement will help you make the right decision. Repairs can save you money by fixing minor problems before they worsen. However, if your roof has reached the end of its service life, consider replacing it with a better system. At Kroll Construction, we will carefully inspect your existing roof and determine its true condition. We will tell you whether you need minor repairs or a complete replacement. We offer architectural shingles from IKO and TruDefinition® Duration® Shingles from Owens Corning. Schedule a free roof inspection and estimate by calling us at (888) 338-6340 today. We will inspect your entire roofing system and suggest solutions fit for your home’s design and budget.